RIT’s sustainability and remanufacturing guru is among the academics, thinkers and business leaders to share ideas and research on circular economy topics in The Ellen MacArthur Foundation’s publication series, A New Dynamic. 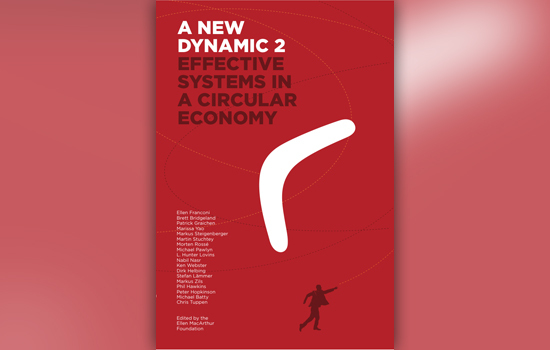 In the second book in the series, A New Dynamic 2: Effective Systems in a Circular Economy, Nabil Nasr, associate provost and director of the Golisano Institute for Sustainability, is among an exclusive group of authors from a wide variety of backgrounds who share methodology and provide real-life case studies illustrating the application of circular economy principles and their potential. The book reflects on the necessity to develop a whole-system approach to re-think the world’s economy. The circular economy refers to an industrial economy that is restorative by intention and eliminates waste through thoughtful design. From detailed analytics to big-picture insights, each author tackles a specific theme and reflects on the potential and implications of a regenerative economic framework. In his chapter, Nasr critically considers a range of remanufacturing definitions and descriptors while examining the history and profile of the current global remanufacturing industry. His writing considers the importance of incorporating the principles of “design for remanufacture” to optimize the utility of products and maximize the contribution of remanufacturing in a circular economy. The book exemplifies the values of the Ellen MacArthur Foundation, the U.K.-based organization created in 2010 to accelerate the transition to a circular economy. The foundation also is creating a global teaching and learning platform by encompassing work with leading universities, schools and colleges. RIT last year became a Pioneer University within the foundation’s Higher Education program, joining a select group of universities worldwide dedicated to accelerating a global transition to a regenerative, circular economy. A New Dynamic 2 brings together thought leaders such as Nasr who can see beyond the boundaries of their respective areas of expertise and establish the necessary connections to re-think the world economy’s current development path. The portfolio of chapters provides both analytical and action-oriented insights that point towards a new regenerative framework for economic prosperity. Go to bit.ly/ANewDynamic2 for more information on the book.